By 1996, post-millennials were living in a world that had already been introduced to modern Disney classics such as Aladdin, The Lion King, Beauty and the Beast and Pocahontas. Although the year brought The Hunchback of Notre Dame, 1996 didn’t have nearly as many major Disney releases as years past. Estefany was born in the year 1996 but her introduction to the magical world of Disney began in 2001 with its fourth animated feature film, Dumbo. Although a traumatic experience (many tears were shed when Dumbo was separated from his mother), the magic stuck. 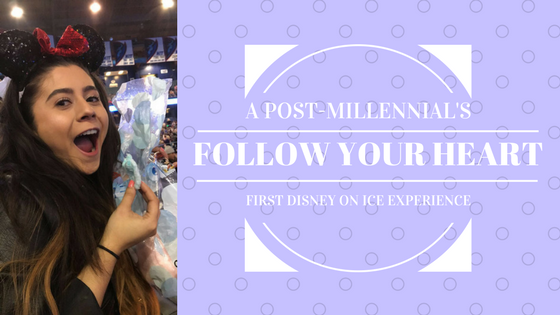 Nearly 16 years later, Estefany expanded her Disney horizons by attending opening night of Disney on Ice: Follow Your Heart. Walking into the venue, she had no idea what the evening had in store. She was greeted with vibrant colors and elevated spirits. Children in costumes walked past holding souvenirs that lit up, spun or had two round ears. The smell of cotton candy wafted through the air and the taste of multi-colored snow cones were practically on the tip of the tongue. As the lights went down and the music started, the magic was as real as ever. With 38 speaker enclosures and 2,400 watts of power, it’s hard not to be impressed. Introductions were made and the show’s ringleaders emerged – Mickey, Minnie, Donald and Goofy. In addition to the traditional ringleaders, Disney/Pixar’s Inside Out Emotions made their Disney on Ice debut to tie each storyline together. Joy, Sadness, Anger, Fear and Disgust help Riley gain the confidence she needs to win her hockey game – all while princesses, toys and sea creatures alike tell their own stories. Each Princess solo was more fascinating than the last. Merida and Tiana had solo sets to their theme music while Cinderella, Ariel, Mulan, Jasmine and Rapunzel share their sets with their leading men. Ariel and Eric as well as Rapunzel and Flynn add a special element to their sets as Ariel flies 30 feet off the ice during a Spanish web and Rapunzel soars a remarkable 35 feet during an aerial silk act. Three additional Princesses get their own full storyline within the show. Belle, Snow White and the sisters of Frozen danced their way across the ice as they shared their narrative. From “Be Our Guest” to “Let It Go”, each performer skated elegantly. A special treat to the first act is a scene from Fantasia, conductor Mickey and dancing broomsticks included. It’s another elegant performance with spectacular costumes and choreography. The second act included full storylines from Finding Dory and Toy Story. First was the under-the-sea adventure where Dory finally remembers her family and searches for them with the help of Nemo and Marlin as well as a massive octopus named Hank. The impressive 152 suckers on Hank’s tentacles was one of the stand-out props of the show, which had a total of 181. Toy Story was introduced by the sounds of “Woody’s Roundup”, the theme song from Woody’s show in the second film. Buzz Lightyear, Jessie, Ham, Rex and a variety of green army men accompany their set and deliver one of the final performances of the night. Between the 60 characters and the interwoven storylines, each individual element of the show is clearly well thought out and intricate. For being nearly 21 years old, Estefany bore the same expression as the children around her: pure joy. Pun intended. This show was not just for the young; it was for the imaginative, the creative, the whimsical and – most important – the child within.